Steve Magaña, a student from Pasadena, California, has been largely inspired by his hard-working mother. Despite financial difficulties, he has learned his mother’s values, and has devoted himself to his academics and community. He hopes that through obtaining a college degree, he will be able to help his mother in the future. As a junior at Maranatha High School, he has enrolled in many Honors and Advanced Placement courses throughout high school, and has appeared on the Honor Roll several times. He became interested in science after winning a science fair when he was young. However, he is also interested in law and government as a result of the injustices that he has seen in his own Latino community. Steve enjoys tutoring students after school as part of the National Honor Society and the California Scholarship Federation. He is currently the Vice President of the Hispanic Honor Society, which he founded along with his AP Spanish teacher. Additionally, he is involved with Future Business Leaders of America (FBLA) where he is learning essential leadership and business skills. Steve is interested in a career in biomedical engineering or law. His interest in becoming a biomedical engineer stems from a desire to help those with physical disabilities as a way of giving back to the less fortunate. Similarly, his interest in becoming a lawyer has grown out of a feeling of duty to defend his Latino community. Steve mentions that his participation in the R2L NextGen program has taught him how the government operates. “The R2L NextGen program was an awesome experience that changed my life. It has given me even more confidence in myself and motivation to succeed. I’m excited to continue working with CHCI in the future,” he said. 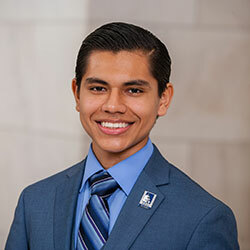 Steve will continue developing his leadership skills this summer through his participation in the Youth Leadership Institute at the University of California, Irvine through the Hispanic Scholarship Fund. The CHCI familia is proud of Steve’s accomplishment and excited to see what more he will do as he continues to develop a leader. To support dynamic students like Steve Magaña and CHCI’s programs, please visit: www.chci.org/donate.